Reusable! Our most durable and strongest mail pouch found in today's mailroom, mail center, warehouse and office - perfect for courier use. Crafted of heavy-duty reinforced vinyl laminate to withstand the riggers of frequent use. 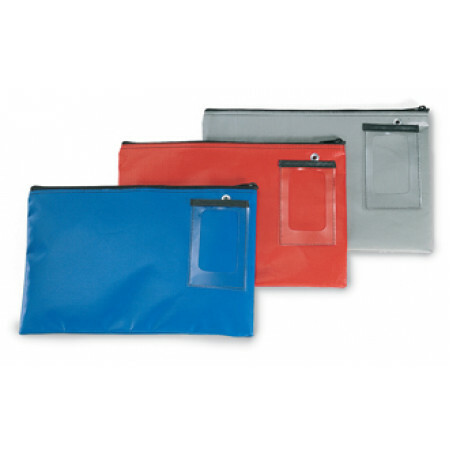 Moisture resistant material and easy to clean vinyl makes this mailbag one of a kind. Includes address card holder for outgoing and incoming addresses, cardboard address cards sold separately click on - Part 1001. Keep zipper closed with optional tamper resistant plastic cable locks click on - Part 1000 or secure your mail pouch with our optional small padlock click on Part 29LK for keyed alike locks. Size: 14"L x 9"H Part 2912 in Red, Part 2916 in blue, Part 2918 shown above. • Round trip mailbags are made of 18 oz reinforced vinyl coated for water resistance. • Single eyelet is pressure fitted. • Zipper is #5 chain with single steel slide.